Breaking: *IRON ORE FUTURES IN SINGAPORE SURGE 5.9% AFTER CHINA PMI DATA, 9:27pm ET. PMI came in solid, above its 12-month average. The China’s yuan fixing was set at the strongest level since October – a sign the PBOC doesn’t see any major growth concerns around the corner. It was a picture perfect week in Manhattan. Dry air, a light breeze, the birds were chirping in central park and we witnessed a high of just 72 degrees in late July? It was a treasure to behold. St. Louis Fed’s Financial Stress Index is right on five year lows. Since February 2016 – just as the Fed arrested the U.S. dollar’s vicious accent – month after month financial conditions have eased. Which begs the question? From 2014-2016, as the strong U.S. dollar contributed to global dis-inflation – lower commodity prices – won’t the weaker dollar contribute to a surprise burst of global inflation? Central bankers think they can contain the beast inside the market, but he’s in there – the unintended consequences are a plenty. All is calm, but something is lurking beneath the surface of the financial markets. Investors expect no surprises from the Federal Reserve this summer – this week the chances of a September rate hike fell below 10%. It’s motionless seas as far as the eye can see. In recent weeks, Fed rate-hike expectations have plummeted given the market’s myopic focus on the Fed’s long promised balance-sheet normalization kickoff. The odds a December rate hike are now priced at less than 35%, down from 70% just six weeks ago. At this week’s Federal Reserve Open Market Committee meeting, there were a few developments lifting eyebrows on Wall St. Officials removed references to inflation declining “recently” and being “somewhat” below their 2% target in a portion of their eager monitored statement. After lofty promises, uncertain fiscal policy out of Congress and the White House has laid a beating on the dollar. After a post election surge to 104, she touched 93 this week. A weak dollar is fueling the reflation trade globally – commodities and emerging markets have been major beneficiaries. The CRB (Commodity Research Bureau ) index is nearly 10% higher over the last year, while the $EEM (iShares MSCI Emerging Markets ETF) is 25% higher since January. There’s something on Janet’s (Fed Chair Yellen) mind. Commodity prices are rising at the fastest pace in five years. The global reflation picture is nearly on the Fed’s doorstep. In our view, there’s a surging probability the Fed gets thrown off track in 2H 2017, they are behind the curve. What’s copper telling us about inflation expectations here? Believe it or not, one of the keys to 2H equity market stability is a sustainable path of sleepy inflation expectations. Wall St. has taken their inflation outlook lower and lower in recent months. Any surprises to the upside – in inflation expectations – would motivate the Fed to put forth a more aggressive withdrawal of policy accommodation (employ more rate hikes). This outcome would be would be fairly disruptive in our view – signal that the Fed is behind the curve. Central banks in Brazil and Colombia cut rates again this week – despite many developed market central banks signaling less accommodative (Canada, U.S., U.K., ECB) monetary policies looking ahead, emerging market central banks still have the punchbowl in “fill’er up” mode. So we have a large group of EM central banks easing monetary policy with the U.S. dollar in the middle of its sharpest decline in five years – how do you spell “over-heat” risk? 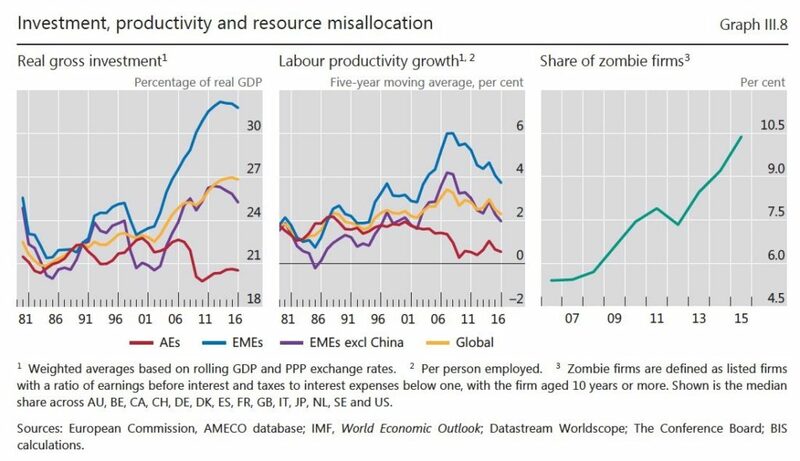 Developed market central banks are “trying” to remove accommodation while EM bankers are adding at a 2-1 pace (see above)? Coal’s 24% Surge Since June 1st, Hello Janet… Can you Hear Me Now? Calm CPI (inflation data) in the U.S.A. has the Fed in relax mode but when you look around the world – other forces are driving prices higher. This week, copper surged to the highest level in more than two years on expectations that demand in China will fuel a global shortage. There were even plans in the country to curb metal-rich waste imports reinforcing a bullish outlook. Benchmark three-month prices rallied as much as 2.8% to $6,400 a metric ton, the highest since May 2015, and were at $6,296 at 11:09 a.m. in London. That’s a fourth day of gains, and adds to Tuesday’s 3.3% jump, Bloomberg noted. Yesterday’s news? U.S. PCE Inflation – the orange line above – the Federal Reserve’s preferred measure of inflation has declined for three straight months, to 1.4%, from 2.1% in February. Tomorrow’s news – the global inflation backdrop is a major problem for the Fed – there’s far too much attention focused on the sleepy U.S. inflation picture. Strong infrastructure investment in the first five months of the year is helping China reflate their asset bubble in desperate search of maintaining 6.5% growth rate in 2017. The question remains – did those ten “mad men” in a room in Beijing put too much pressure on the gas pedal this time? If we look back at the 2014-2016 regime and ask what did the Wall St.’s economists get most wrong in trying to read the Fed? Far and away the answer to this question lies in global economic (disinflation) pressures. Back then, U.S. economists we far too focused on “robust” domestic economic data and were looking for 12 (yes twelve!) rates hikes (2014-2016) while ultimately the Fed only delivered two. Economists were blinded by the positive U.S. data and couldn’t see the deteriorating global macro risk factors tied to the U.S. dollar’s violent surge. Global economic weakness was a drag on Fed policy – eventually forced the central bankers to lay down on their loudly promised rate hikes. Today, many U.S. economists are asleep at the switch again. They’re far to focused on “goldilocks” calm U.S. inflation data (see the orange line above). In a dramatic reversal from 2014-2016, the global inflation picture could very well force the Fed into surprise rate hikes. That picture perfect view over the Manhattan skyline could very quickly turn to darkness. If the Fed is forced to take Mr. Punchbowl away too quickly, the global reflation revival could be the a summer spoiler. Lets look over a few important developments clients were talking about this week – focus was on the J.P. Morgan investor (quarterly) conference call. As the largest bank in the United States – it’s important to dig through the data, trends and themes found in the transcript below. The relationship between the Fed’s balance sheet and equity prices is clear – the question is, how will stocks react to central bank deleveraging? As most investors know – Wall St. expects the Federal Reserve to initiate a reduction in their $4.4 trillion balance sheet this September. J.P. Morgan made some startling forecasts this week relative to the impact of the Fed’s planned actions. Federal Reserve deleveraging will lead to loss of deposits at banks, somewhere between 50%-66% of reduction. Looking forward, $1.5T Fed SOMA (balance sheet) reduction would result in $750B – $1T of deposit outflows from the banks. Doing some work here is a necessity – the unintended consequences of central bank policy actions are many and will be disruptive. As new supply – U.S. treasuries which need to be sold to fund government spending – comes to market, without the FOMC there cash will pour out of the U.S. banks. In the second quarter, JPM witnessed $8B leave deposits into stocks. We have not seen this type of shift into equities in a long time. This is a positive for BlackRock / Pimco’s of the world – as bank deposits shift into ETFs and asset management products, they are the big winners. Over the last year the Federal Reserve has been buying $20 to $35B a month of Treasuries and Mortgage Backed Securities. As bonds mature, the Fed has been reinvesting the proceeds – QE (asset purchases) has been very much alive and well. As the Fed steps away from reinvestment – there will be more treasuries for investors to buy. J.P. Morgan is anticipating substantial bank deposit outflows, these assets should make their way over to the portfolio managers at companies like BlackRock. As you can see (top right above), just as the Fed signaled balance sheet reduction, BlackRock equity is up 17% since the March FOMC meeting. Over the same time, the XLF (Financial Select Sector SPDR Fund) is only 6% higher – BlackRock investors have been pricing in some central bank love. As the Fed takes DOWN their balance sheet – BlackRock and Pimco will be the net Treasury buyer. In other words, the Fed’s planned $1.5T reduction its balance sheet – a lot of these assets get reallocated over to BlackRock and Pimco, 20bps on $1.5T is real money. Good morning, everyone. I’m going to take you through the earnings presentation, which is available on our website. The firm reported record net income of $7 billion, EPS of $1.82 and a return on tangible common equity of 14% on revenue of $26.4 billion. Included in the result is a legal benefit of approximately $400 million after tax from a previously announced settlement involving the FDIC’s Washington Mutual receivership. Other notable items, predominantly net reserve changes and legal expense, were a small net negative this quarter. So underlying adjusted performance was really strong. And highlights for the quarter include: average core loan growth of 8% year-on-year, reflecting continued growth across products; double-digit consumer deposit growth; strong card sales, up 15%, and merchant volume, up 12%; #1 Global IB fees, up 10%; and we delivered record net income in both Commercial Banking and in Asset & Wealth Management. Some more details about the quarter. Revenue of $26.4 billion was up $1.2 billion or 5% year-on-year, with the increase predominantly in net interest income, up approximately $900 million, reflecting continued loan growth and the impact of higher rates. Fee revenue was up $300 million year-on-year, but adjusting for one-time items in both years, was down modestly, with lower Fixed Income Markets, Mortgage and Card revenues, all as guided, being offset by strong fee revenue growth across remaining businesses. Adjusted expense of $14.4 billion was up a little less than $400 million year-on-year, with auto leases being the biggest driver, but also including the impact of the FDIC surcharge and broader growth being offset by lower compensation. Credit costs of $1.2 billion were down $187 million year-on-year on [lower] reserve builds as a net reserve build in Consumer of a little over $250 million, driven by Card, was offset by a net release in Wholesale of a little under $250 million, driven by Energy. Anticipating you may have questions, given the recent stress in oil prices, I would emphasize that we guided to expect reserve releases, given we started the year with $1.5 billion of energy-related reserves. And with oil prices having found a lower but seemingly stable level, we feel appropriately reserved. Shifting to balance sheet and capital. We ended the quarter with binding fully phased-in CET1 of 12.5% under the standardized approach, with the improvement being primarily driven by capital generation, offset by net loan growth. We’ve been hovering around the inflection point under the Collins Floor for a while now and expect standardized to remain our binding constraint from here. Given that, we’ve replicated this page under standardized rules in the appendix for you to read. Balance sheet, risk-weighted assets and SLR all remained relatively flat from the prior quarter. I would also note that we remain compliant with all liquidity requirements. We were pleased to announce growth repurchase capacity of up to $19.4 billion over the next 4 quarters. And the board announced its intention to increase common stock dividends 12% to $0.56 a share effective in the third quarter. In addition, we recently submitted our 2017 resolution plan, which we believe fully addresses outstanding regulatory feedback. Consumer & Community Banking: CCB generated $2.2 billion of net income and an ROE of 16.5%. We continue to grow core loans, up 9% year-on-year, driven by strength in Mortgage, up 12%; Card and Business Banking were each up 8%; and auto loans and leases were also up 8%, driven by strong lease performance from our manufacturing partners. Deposit growth continues to be strong, up 10% year-on-year, with household retention remaining at historically high levels. We saw improvement in our deposit margin, up 16 basis points. Sales growth in Card was very strong again this quarter, up 15%, as new accounts mature. And merchant processing volumes grew double digits, up 12%. Revenue of $11.4 billion was flat year-on-year. But recall that last year included a net benefit of about $200 million, principally driven by the Visa Europe gain. So excluding that revenue, it was up modestly. Consumer & Business Banking revenue was up 13% on both strong deposit growth and margin expansion. Mortgage revenue was down 26% as higher rates drove higher funding costs, which, together with lower MSR risk management and lower production margins, put pressure on mortgage revenue year-on-year. In addition, revenue included a reduction of approximately $75 million to net interest income related to capitalized interest on modified loans. And Card, Commerce Solutions & Auto revenue was down 3%, but if you exclude the noncore items I mentioned, was up 2%, with NII growth on higher loan balances and higher auto lease income, predominantly offset by the continued impact of investments in Card new account acquisitions. Expense of $6.5 billion was up 8% year-on-year on higher auto lease depreciation, higher marketing expense and continued underlying business growth. U.S. banks are witnessing a significant surge in credit card defaults – something we’re tacking closely. Finally, on credit performance. Card Services drove higher net charge-offs year-on-year, but still within our guidance for the full year of less than 3%. Net reserve builds were around $250 million, building $350 million in Card, $50 million in Business Banking and $25 million in Auto, in part due to loan growth and in part higher loss rates in Card. This was partially offset by a release of $175 million in Mortgage, reflecting continued improvement in home prices and lower delinquencies. To touch on consumer delinquency trends, in particular in Card, we are seeing some early signs of normalization, which are generally in line with our expectations and our credit risk appetite. And in Auto, our trends are relatively flat. Corporate & Investment Bank: CIB reported net income of $2.7 billion on revenue of $8.9 billion and an ROE of 14.5%. In Banking, IB revenue of $1.7 billion was up 14% year-on-year, with strong performance across products but particular strength in DCM. We ranked #1 in Global IB fees and #1 in North America and EMEA. We were also #1 in ECM and DCM globally, in each case gaining share for the first half of this year. Advisory fees were up 8%, benefiting from a large number of deals closed in this quarter. Equity underwriting fees were up 29%, better than the market, but relative to a weak prior year quarter. With a strong market backdrop and supportive valuations, we saw continued momentum in global issuance, especially IPOs. And debt underwriting fees were up 5% from a strong quarter last year, driven by the high flow volume of repricing and refinancing activity, even with fewer large acquisition financings. In terms of the outlook, we expect IB fees in the second half of the year to be down year-on-year, given that we had the highest IB fees on record for a third quarter last year. That said, overall sentiment remains positive. ECM issuance is expected to continue, given the stable market backdrop. And the M&A backlog is healthy, with conditions remaining constructive for refinancing activity. Treasury Services revenue of $1.1 billion was up 18%, driven by higher rates as well as operating deposit growth. Lending revenue of $373 million was up 35%, reflecting lower mark-to-market losses on hedges of accrual loans. Moving on to Markets, total revenue was $4.8 billion, down 14% year-on-year. Fixed Income revenue was down 19%, with decent performance across products relative to a very strong second quarter last year, which was driven by higher levels of volatility and activity broadly, including as a result of Brexit. This quarter conversely can be characterized by a lack of idiosyncratic events resulting in sustained low volatility, reduced flows and continued credit spread tightening, all of which impacted activity levels in rates, credit trading and commodities. Emerging market performance was relatively stronger on a weaker dollar and lower rates as well as some regional events. Equities revenue was down 1%. In derivatives, on the structured side, we did quite well and outperformed. And on the flow end, we held our own in a quiet and therefore challenging environment. Prime was a bright spot as we are realizing the benefit of the investments we’ve been consistently making. Before I move on, I would also like to remind you that the third quarter of 2016 markets revenue was also a record since 2010. In fact, it was about $1 billion more than the average of the previous 5 years. And so while that isn’t guidance, it is context as this quarter has felt quiet, more like prior years. Securities Services revenue of $982 million was up 8%, driven by higher rates and higher asset-based fees on higher market levels. And remember, the second quarter benefits from dividend seasonality. Finally, expense of $4.8 billion was down 5% year-on-year, driven by lower compensation expense and the comp-to-revenue ratio for the quarter was 28%. A look at Commercial Banking. Another quarter of excellent performance with record revenue and net income and an ROE of 17%. Revenue grew 15%, driven by deposit NII as the rate environment continues to be favorable and on higher loan balances with spreads remaining steady. IB revenue was down due to the lack of large deal activity during the quarter, but underlying flow activity was solid across products as momentum continued and forward pipelines appear strong. Expense of $790 million was up 8%, and we expect this to grow modestly in the second half as we continue to execute on the investments in bankers and technology that we outlined at Investor Day. Loan balances were up 12% year-on-year and 3% quarter-on-quarter. C&I loans were up 4% sequentially, ahead of the industry, on broad-based growth across markets and within specialized industries. CRE saw a growth of 2%, in line with the industry, but below last year’s pace on reduced origination activity as we continue to be selective at this stage in the cycle. Finally, credit performance remained very strong with a net charge-off rate of 2 basis points. Leaving the Commercial Bank and moving on to Asset & Wealth Management. Asset & Wealth Management reported record net income of $624 million, with pretax margin of 32% and an ROE of 27%. Revenue of $3.2 billion was up 9% year-on-year, driven primarily by higher market levels, but also strong banking results on higher deposit NII. Expense of $2.2 billion was up 4% year-on-year, driven by a combination of higher external fees and compensation on higher revenue. This quarter, we saw net long-term inflows of $9 billion with positive flows across multi-asset, fixed income and alternatives being partially offset by outflows in equity products. We saw net liquidity outflows of $7 billion, largely due to specific client deal-related cash needs. Record AUM of $1.9 trillion and overall client assets of $2.6 trillion were both up 11% year-on-year on higher market levels. Deposits were flat year-on-year and down 5% sequentially, reflecting the beginning of balance migration into investment-related assets, as expected, and those balances remained with us. Finally, loan balances were up 9% year-on-year, driven by mortgage, up nearly 20%. Corporate reported net income of $570 million, which includes the legal benefit I mentioned earlier of $645 million in revenue or $400 million after tax. And a reminder, this is the same $645 million that was publicly announced in August 2016 and represents partial reimbursement for costs that we have previously incurred and paid that remained the responsibility of the WaMu receivership. Outlook: starting with the quarter, we guided second quarter NII (net interest income) to be up about $400 million from the first quarter, given the rate — the March rate hike, but you’ll see that the NII for the quarter increased by only $150 million. While we did fully realize the expected benefit of higher rates and continued growth, against that, we had the onetime $75 million mortgage adjustment as well as lower CIB market NII. These effects, together with modest downward pressure from lower 10-year rates, with all other things equal, point to a full year number of closer to $4 billion up rather than the previous $4.5 billion, but with a potential to be higher if we continue to benefit from tailwinds of lower deposit reprice. So you will see we have adjusted the guidance, but it will be market-dependent. And any near-term forecast is sensitive to a number of factors, none of which changes our conviction that we will ultimately deliver $11 billion plus of incremental NII as rates normalize, and we are well on our way. On expense, we continue to expect full year adjusted expense of $58 billion. Second quarter was in line with our expectation and our guidance at a little better than $14.5 billion, which is also where we expect the third quarter to come in. Finally, we have revised our full year core loan growth down to 8% year-over-year, but a couple of comments. First, we are seeing slightly lower growth than we expected coming into the year, it is only modestly lower. And more importantly, we remain encouraged by the consistency and breadth of client demand across products. Secondly, we noted that mortgage could be a big driver. And with a smaller market and a more competitive environment, fewer loans have met our hurdle rate. And of course, we remain appropriately focused on quality and not quantity of growth. And as such, loan growth is an outcome, not a target. So to wrap up, we are very pleased with the firm’s performance this quarter, with all of our businesses showing broad strength. We maintained or improved leadership positions [above] delivering the benefits to both clients and shareholders of our operating model and our continued investments. We remain encouraged by the growth outlook for the global economy and expect continued solid growth here in the U.S., which positions us well going forward. William McChesney Martin, Fed Chairman from 1951 to 1970, special thanks to our associate Arthur Bass for this gem. As U.S. unemployment crept lower in recent years, Federal Reserve Chair Janet Yellen stayed with the slow crawl of policy tightening. Which begs the question, did the Fed keep interest rates too low for to long? Friday’s jobs report showed payrolls rising 222,000 in June, the biggest increase since February. At first glance it appears joblessness has fallen further, to 4.4% in June from 4.7% at the end of last year and 5% in December 2015. Average hourly earnings have risen at an average year-on-year pace of 2.6%, but lets look beneath the data to see what’s really going on. A picture says a thousand words – stubbornly low wage growth is being held back by an army of young people still sitting outside the labor force. Blaming the 2008 financial crisis for this dynamic is the biggest copout in modern economics. Just look at 2012-16 data, it’s clear this problem is structural NOT cyclical at this point. Much of the media cheerleading during the Obama years covered up some UGLY data that’s still with us today and had a lot to do with the election of President Trump. Far from intentional, but hopeful Media and Wall St. “Fed (central bank) cheerleading” has misled investors for years. Every January like clockwork – from 2012 – on we were promised a “great rotation” out of bonds and into stocks. Every year, the crowd has called for higher rates and bond yields – only to see them plummet again and again. Year after year, bonds were panned – but often times were the place to be. Hope is not an investment strategy – only by digging into the hard facts can the truth be found in the bond market. Central bankers globally have created the mother of all asset bubbles here. The reach for yield is unprecedented. Interest rates should be used to price risk, today the risk-pricing mechanism is broken, it’s toxic. Labor productivity is a measure of economic results – a comparison of the amount of goods and services produced (output) with the number of labor hours used in producing those goods and services. It is defined mathematically as real output per labor hour. Growth occurs when output increases faster than labor hours – but we’ve seen very little of our long lost friend. Labor productivity growth can be estimated from the difference in growth rates between output and hours worked. During the 2012-2016 business cycle – labor productivity grew at a sad annualized rate of 1.1%*. This growth rate is notably lower* than the rates of the 10 completed business cycles since 1947—only a brief six-quarter cycle during the early 1980s posted a cyclical growth rate that low (also increasing 1.1%). That’s ugly indeed, but what’s driving this picture? Full Employment with Youth on Strike? There’s a lot going on in labor market data – far more than who led the country at one time or another. We must ask a few questions? 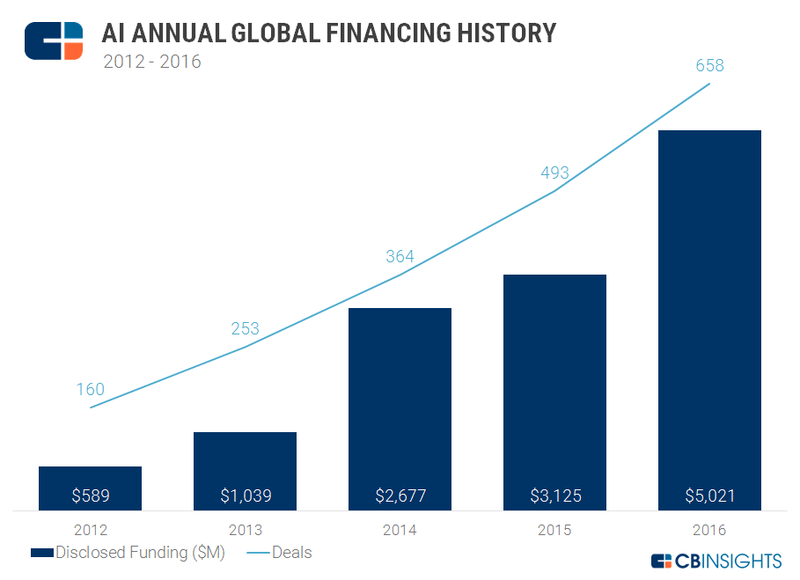 How much is AI artificial intelligence (robotics) at play here? By keeping interest rates so low for so long, has the Federal Reserve brought forward billions in venture capital dollars (funding the AI explosion) into a short period of time? 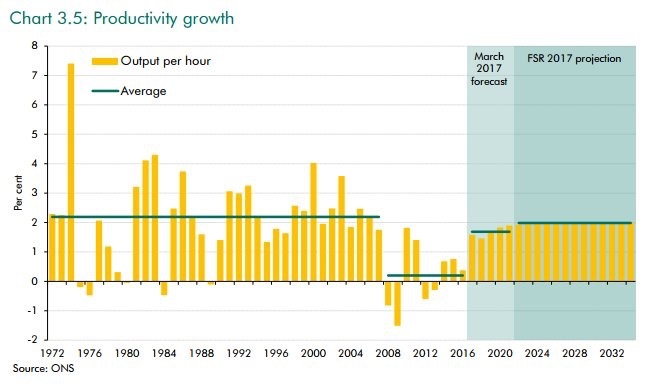 Investments which would have come over 20 years have been accelerated forward in time – displacing millions of workers? How many jobs across the U.S. retail sector are robots eating each year? Since October 2016, employment in the U.S. retail sector has plunged by nearly 160,000 jobs, that’s easonally adjusted, BLS data. Artificial Intelligence, the AI Explosion, thanks Janet? *From 2007 to 2017 the U.S. population grew to 325M from 301M. Only 4m new full time jobs on a population 24m larger? Yes, as immigration makes up most of the population growth, there are far less full-time jobs to support the influx of people jumping over the border – even less to support middle class Americans. This helps explain secular stagnation and endlessly low bond yields – the U.S. has been in a productivity depression. Total hours worked per employee plunged during the Obama recovery – especially 2013-15. If you do the math, there’s roughly 20 million relatively young people NOT in labor force, this speaks to the opioid tragedy and income inequality. The U.S. maintains 5% of the world’s population – but consumes 80% of the opioids produced on earth annually*. The media blames demographics, but that’s only part of the problem – these are fairly young (25 to 54 years old) displaced workers. There’s a reason why President Trump turned Michigan, Wisconsin and Pennsylvania red for the first time since the mid 1980’s – it has far more to do with the above data than Russians. Opioid abuse kills more than 100 Americans per day. There are as many opioid prescriptions written annually in the United States as there are adults. Over 97m Americans used prescription pain relievers in 2015 – while over 12m persons misused** their prescriptions. Lots of financial engineering – NOT enough real job creation. Low rates for too long has created “Zombie firms (top right above).” Zombie firms are defined as public companies with EBITDA (earnings before interest, taxes, depreciation and amortization) to interest expenses ratio below one. Today we’re looking at 125.6m 24-54 Year Olds actually in the Labor Force. As a percentage of the population – this number has come down over the last decade. Janet Yellen and her colleagues say they’re closing in on full employment, and she’s tiptoed closer to suggesting that slack has been absorbed, though she never declared total victory. She said in January that the labor market was “reasonably close” to the committee’s maximum employment objective, for instance, and that the cyclical element of participation declines had “largely” disappeared. May have been Lingering on the Sidelines? Really? The latest data could vindicate the idea that potential workers may have been lingering on the sidelines. The Fed has lifted rates only slowly, and the effect on the economy has been limited as financial conditions remain easy. Against that backdrop, employers continue to hire rapidly, taking on 222,000 new workers last month. It seems they’ve finally scraped bottom when it comes to people who are actively applying to jobs and thus classed as unemployed. Unemployment was 4.4 percent in June, up from a 16-year low of 4.3 percent the month before, and the share of people moving from unemployment to jobs has moved lower. As that has happened, employers have begun to tap sidelined labor pools. The shift has helped to stabilize — and now slightly lift — the labor force participation rate, which measures what share of the population is working or looking for a job. That’s an especially sweet accomplishment for the Fed because it flies in the face of demographic trends, which should be weighing the rate down. President Donald Trump is increasingly unlikely to nominate Federal Reserve Chair Janet Yellen next year for a second term, four people close to the process told Politico. Yellen’s Job is Cohn’s if he wants it, and he would win Senate confirmation easily, one Republican close to the selection process told Politico. National Economic Council Director Gary Cohn is now the leading candidate to succeed Yellen as the world’s most important central banker, these people said. Yellen begins two days of congressional testimony on Wednesday, and her own future in the job may come up in questioning. You have to go back to the 1970s to see a non-economist Fed Chair, we’ve been telling clients all year – we believe Trump wants a practitioner, NOT another academic who’s never taken professional risk. G. William Miller was Fed Chair under President Jimmy Carter, the last Chair outside academia to run the world’s most powerful central bank. Gold prices plunged again Friday, now 7% off their June highs, while the gold miners GDX sits 12% lower over the same period. What’s going on? As central bankers from the U.S., Canada, Europe and Asia have turned more hawkish (publicly discussed pulling back accommodation) – bond yields have surged while gold has plunged. *OIS swaps, looking out over the next 11 months to June 2018. Most of this move higher occurred after Mario Draghi’s speech last week. Banks like HSBC are anxiously adjusting their outlook, now forecasting 10-yr German bund yields will hit 90bps (53bps today – 22bps in June)) by year-end. The breadth of that kind of sell off brings back memories of Jean Claude Trichet’s ECB. Their 2011 rate hike was judged by most market participants as a disaster – pulling back accommodation into a deflation storm. In our opinion, President Trump is in Fed chair Yellen’s head – legacy in on her mind. With Yellen’s term up in February and receiving no visibility on a White House re-appointment – Yellen has been digging in. She’s taking this opportunity to pen a few pages in the history books. After years of gross over-accommodation – an easy money gravy train pumping up asset bubbles – Yellen’s Fed is singing a far different tune today. If she goes out – the Yellen Fed wants the world to know in their last 9 months of service, they tried to let some air out of the balloon. Federal Reserve Chair Janet Yellen has been making the case – strong hiring will feed through to higher wages and price pressures over time. She will explain her views on the labor-market and the Fed’s colossal balance sheet (levered 77-1 see below) when she delivers semi-annual testimony to Congress next week. She speaks to the House Financial Services Committee on July 12 and the Senate Banking Committee on July 13. *CFTC data, highest since January 2016 – signals that global central banks are shifting ever closer to pulling back economic stimulus helped boost bearish bets on the gold to the highest in almost 18 months. A hawkish turn by the Fed has two year bond yields at 6 year highs. Government bonds globally have lost nearly $350B in recent weeks under the bond sell off siege. To add fuel to the fire, this week’s ECB minutes (European Central Bank) hint toward coordination with Yellen’s FOMC. The “financial conditions” targeting narrative we laid our in our Bear Traps Report (in June) is picking up believers, moving toward a consensus view. We have an index of our 21 Lehman Systemic Risk Indicators, the Chicago Fed’s Financial Conditions Index is similar above. Over much of the last five years – as financial conditions tightened, gold surged (see above). On the other hand, in 2017 we’ve witnessed a regime change. This year as the Fed has hiked rates twice – financial conditions eased – NOT tightened. As long as financial conditions are NOT stressed – Yellen’s Fed has runway on the hawkish side to pull back accommodation. Relationship to gold? A year ago today there were close to $15T of negative yielding bonds on earth – this number is now well below $7T today. As bond yields have surged – globally gold is far less attractive to hold – the macro impact on this metal has been profound. Wall St. has unanimously read the Fed’s recent hawkish turn with focus on the Fed’s balance sheet, NOT rate hikes. At a colossal $4.46T, most of Wall St’s economists see the Fed reducing the size of its SOMA* in September. Wall St’s braintrusts like to hangout together, they typically think very much alike. A year ago today, NOT one firm on the Street believed the Fed would touch the SOMA in 2017, or 2018 for that matter. Today, they’ve moved up their expectations in a panicked hurry. *The Federal Reserve System Open Market Account (SOMA) is a portfolio of U.S. Treasury and Federal Agency securities, foreign currency investments and reciprocal currency arrangements. We must keep in mind, in February there was only a 17% probability of a Fed rate hike in March (according to Wall Street’s economists). This was before the Federal Open Market Committee (FOMC ) began shifting market expectations and ultimately tightened (hiked rates) in March. Rule #1, more often than NOT – Wall St. gets the Fed wrong. Today, the entire street has their eye on September SOMA reduction – rate hikes are (near) unanimously a December issue in terms of street expectations. Our Bear Traps Report research team meticulously measures the breath of crowded trades on Wall St. – very often this is where alpha is found, going the other way. This week, we’ve witnessed a strong correlation between Nasdaq and Rates (Treasuries). Keep in mind, this year the Nasdaq went up with U.S. government bonds as investors rotated from Trump trades into large capitalization growth stocks. This Spring – as DC gridlock took hold – investors rushed into bonds and the Nasdaq 100. Today, this rotation is now in full reverse mode. See our The Bear Traps Report with Larry McDonald; Reflation Revival, Part I – June 21, 2017. U.S. GDP and ISM data has come in above expectations. At the same time, there is far more momentum in Washington than there was during the Comey (former FBI Director fired by President Trump) drama days of early May. Over the last few weeks, the sell off in U.S. Treasuries and FAANG (Facebook, Apple, Amazon, Netflix, Google) equities has been spectacular. Investors are rushing back into value stocks with energy names (XLE, XOP) up 7-9% from their recent lows. Which begs the question, if oil (WTI) can make a move back up above $49 – where will Facebook FB trade? $135? In our view, the 2017 bond market rally – which saw yields plunge from 2.62% in December to 2.12% on June 26th – supported the equity market surge, especially in the Nasdaq NDX. Going on the 9th year of the equity bull market, it’s clear to us the 2017 explosion higher in the Nasdaq 100 NDX had a lot to do with the plunge in long duration bond yields. The recent reversal in this trend has been profound. We must remember, global equities are off to their best start since 1998 – calm waters are sucking a lot of people in to complacency. Too many players are in the same trade selling volatility, they’re stepping in front of a steamroller – trying to pick up a $1 bill. Over the years, time after time we’ve seen this trade print money for weeks on end – only to give it all back in a few days. The VIX, also known as the CBOE Volatility Index has plunged 21% this year – its smallest quarterly average since in eleven years. We’ve also seen the least amount of one-day* surges in any first half year going back as far as 2005. You have to go back to 2004 to find this large a volatility premium. Forty one stocks in the Nasdaq 100 NDX are up 30% or more in the first half of 2017, today’s volatility premium is spectacular. As we start Q3, growth continues to lose leadership. There’s a powerful growth to value rotation developing as the “reflation trade” has stormed back to life. Looking at returns, the Nasdaq 100 futures vs S&P contract are near a ten week low. This is a large problem for hedge fund positioning. Reflation Revival, Why is Wheat Trading like Tesla Equity? In Reflation Trade Revival mode, wheat is trading like Tesla equity. The September wheat futures contract (MWU7) is up 50% since May 15th, 2017. Energy stocks are as under-owned as any sector in the last decade relative to growth. As a result, we’re seeing a colossal sector rotation back into value names (commodity sector equities) as cash hemorrhaging out of big tech (FAANG stocks). As investors pile out of crowded tech trades – positioning risk is HIGHLY elevated at quarter-end when allocators tend to rebalance. In the first twenty days of a new quarter, positioning alpha is 10x higher than average. In other words, getting out in front of the rotation is more important than valuation – as capital flows out of highly concentrated trades it has to go somewhere in a bull market. It’s a growth into value tsunami.